Some crops cultivated at One Straw Farm are a bit more temperamental than others and demand a little more controlled environment. Cherry tomatoes fall under such demanding personality qualities, so we had to ready their future home. 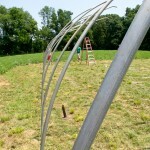 So today Andrew, Dixon and myself worked on setting up the irrigation lines and field covers underneath our hoop houses. Running a tractor under the narrow confines of the metal framing is tricky and ripe with the risk of making costly mistakes, so we had to do things a little differently than normal. Since running a tractor is cumbersome, we opted for a no till soil environment. The three of us manually ran the out the drip tape lines, with some ending up as straight as bow. 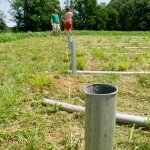 After a little finagling we fixed our errors and tacked the tape down with stakes. Lunch pulled Dixon away from us to the dark tarmac of Kenilworth Market, so the job was Andrew’s and mine to finish. 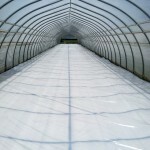 We spent the remainder of the afternoon laying a wider layer of white topped field plastic over the entire interior of the hoop house. The white used as a light reflector rather than a black absorbant, which gives us better climate control of the structures temperature. To top the day off, Andrew and I connected the drip lines to the main hose line and ran some water through to soften the soil underneath. The bell dings 5:00 and home we go. We are fully under way with yet another year at One Straw Farm. The guys are here, there are plants in the ground, and we have finally begun to harvest the first of this years yield. 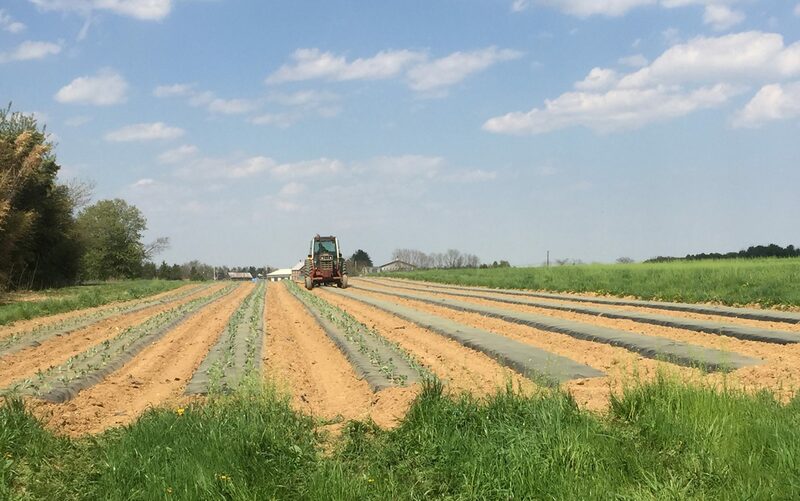 Strawberries, chard, and lettuce are fully mature and ready to be picked for the markets and CSA drop-off sites. We decided that it was time for the farm to get a haircut, so Peter spent the day making U-turns and cutting straight lines, while I did the same on a larger machine. 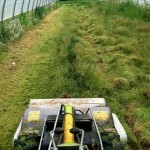 Mowing, while time consuming, is very important to the efficiency of the farm. Keeping weeds and grass under control allows us to move about more freely on the farm, makes irrigation more easy to move, and most importantly, keeps things neat. Much like the way a clean desk makes work easier, a clean farm makes it easier for the farm to operate like a nonstick pan. No Mess. While I was mowing the larger areas of the farm, I was stopped by Dad. 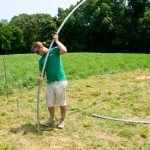 He had accidently knocked a suction line to one of our irrigation pumps into the pond. I was tasked with being the one who would wade out into the baby poop pond muck to retrieve the willful guy. I didn’t argue, it was a billion degrees and humid today, why would I pass up a chance take a swim that would be crazy. After mowing and swimming we enjoyed sammiches and a fresh salad with our old accountant Billy Burnt. Lunch was a treat because Mom made sandwiches for everyone and we didn’t have to trip over one another like we normally do. The normal routine involves everyone dodging each other in their attempt to concoct a unique midday feast. Dixon and I spent the last part of our day clearing brush around one of our irrigation pump sites. It’s hot work, but is one of those jobs where one can easily see their progress. It also helps to find out that hundreds of stinkbugs have made your inactive chainsaw a stinky hotel over the winter. We didn’t discover this until Dixon started the saw, and each and every stinker stinked their stink all at once and came pouring out of the chain saw like a horde of smelly freeloaders. However, smell, heat and broken machinery are simply part of every day work in the life of the farmer. At the end of the day nothing is better than kicking back and relaxing looking back and relishing a hard days work. 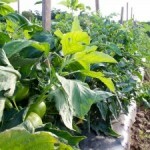 As many people know, compost is an important ingredient to growing good vegetables. The process to creating compost takes as much time as there are ingredients. 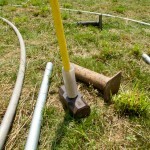 Below are a few pictures of some of the gear necessary for creating a good compost pile. 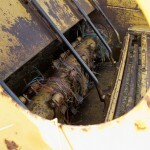 The first two pictures show a parts of a yellow piece of equipment which is a hay shredder. The machine is towed behind the tractor at less than 1 mph (seriously) shoots hay onto the compost pile. 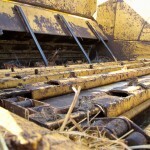 The 600lb bail of hay sits in a trough with a hydraulic operated conveyor beneath it. 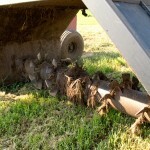 The conveyor pushes the bail into the mouth of the toothed shredder which spins and shoots the separated hay out the mouth underneath, and onto the pile. The second apparatus, which looks like a wing over an arm with spiraled teeth, is a compost turner. Every time a new ingredient is added to the compost pile we much run the compost turner over the pile to chop it up and mix it in. As it rolls through at, once again, under 1 mph, the toothed arm spins to chop up more solid items to mix them in, while the wing over top keeps everything contained in a neat pile. 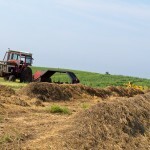 When it is all said and done, each pile receives at least 5 bails of hay and has the turner run overtop at least 10 times; as I said it is a lengthy process! Unfortunately we had a horrific sight in our second wave of tomato fields the other day, the first signs of late blight on those plants. 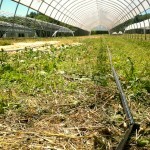 As many may remember from a few years ago, late blight hit the east coast tomato crops hard. That year most of our tomato plants were wiped out, leaving out tomato supply very limited. This year we caught it early and it had only affected a portion of a field that we can see. 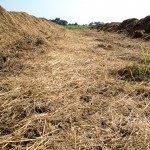 The affected part of the field we tore out of the ground and either had it burned or thrown under a new compost pile. In both cases the disease will be killed, either by flames or the bacterial process of composting. Let us just hope that we caught it before it could spread further. Patrick will have a video out later of us disposing of the blight. I am so sorry that it has taken so long to get up a blog post! We have just switched over to a new web software, and it has been a little bit of a hassle to get everything organized, but without further ado… Here are some shots of the potato digger in action. 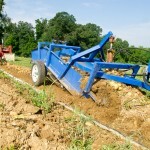 The digger has a horizontal plow blade that digs into the ground to root up the buried potatoes and two flanking circular plow blades that dig the ground on the sides and keep the potatoes from flying sideways. 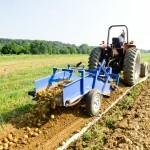 The potatoes then run up a metal conveyor belt and out the back to be thrown onto the ground to be gathered up. 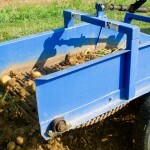 The conveyor is gapped so that dirt will fall through the cracks, but narrow enough so that even the smallest potatoes stay on to be run out the back. On a dry day of digging this can be quite a dirty job, as the digging blade likes to throw up a little bit of dust! 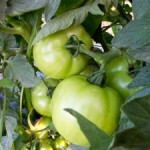 The tomato plants look very healthy, the fruits are growing quite large. With a little rain, and if the plants keep growing at their current rate, our customers may see tomatoes earlier than they have in a while. This year has been good to our crops and allowed everything else to come in early, with a little luck the same will happen for our tomato plants. As always though, no promises can be made, so keep enjoying the produce on the tables now. Still, keep your fingers crossed for an early tomato season! 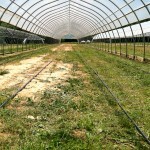 For the first time ever One Straw Farm is growing strawberries in the middle of July. Due to annual popular demand for the little red berry, this summer Uncle Drew decided to try a new variety of strawberry that can withstand the midsummer heat. 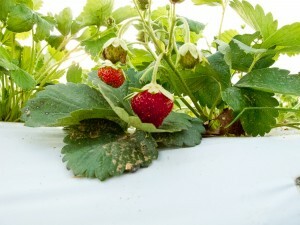 This new variety of strawberry is not as high yield as the cultivar that we grow at the beginning of the summer. While we will try our best to make sure that every customer can get strawberries while we have them, we can make no promises. What I can promise is that the strawberries that you do get will be sweet and fresh.